I can’t promise when but history proves that we will eventually have Spring. For some the season will be brief and summer will take over with all its glory. Spring and summer both hold wonderful opportunities for cocktail parties, backyard socials and of course weddings. Here are some inspiration photos to help you plan your Spring and Summer social events. Theme parties are always fun to plan AND attend. This is a “White Party”. 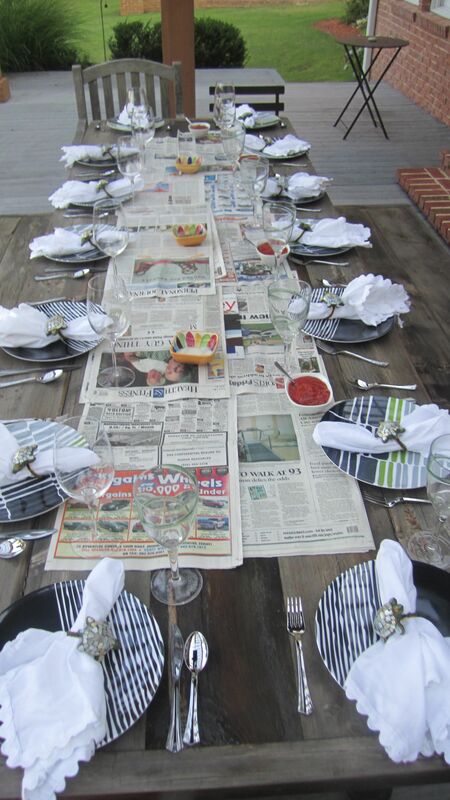 Early May often offers perfect days for outdoor entertaining. 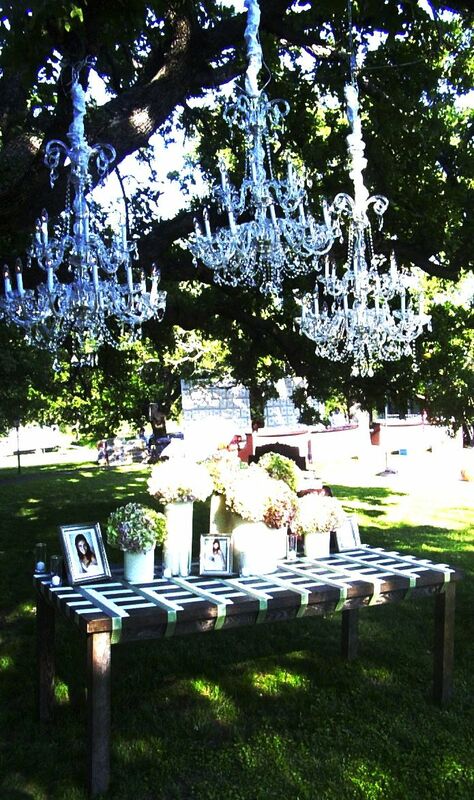 This event was held in the back yard and was done on a small budget. Yet, the monochromatic theme and addition of guests dressed in white AND wearing hats gave the feeling of the social event of the season in the Hampton’s. Items were gathered from surrounding woods and gardens. Containers were purchased at flea markets. And, EVERYTHING was painted or at least highlighted with white. A buffet dinner was offered including White Peach Salad with Gorgonzola and White Balsamic Vinaigrette, Pork Tenderloin (the other white meat), Grilled White Asparagus, Roasted Fingerling Potatoes and White Chocolate Mousse. 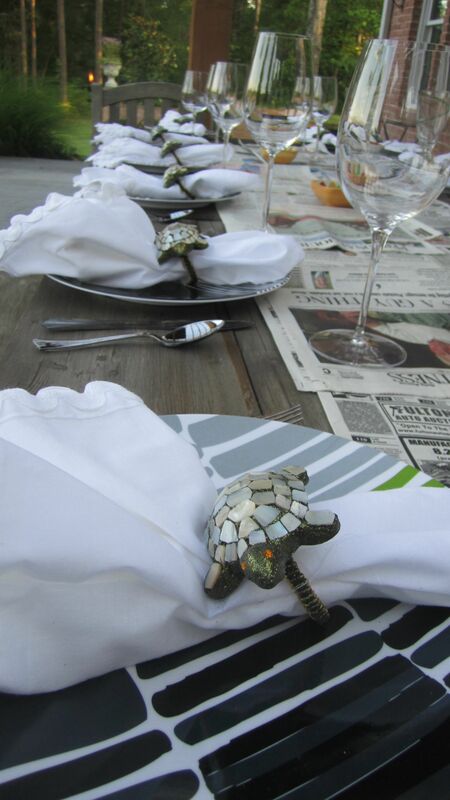 These centerpieces may seem dramatic but they are quiet simple. The idea is to use mass. The first design is a birthday dinner in a restaurant. The container is actually 10 individual 2″x2″ votive cups pushed together and filled with muscari (grape hyacinth), jonquil and lilac. The second design is only two leaves and ten callas. 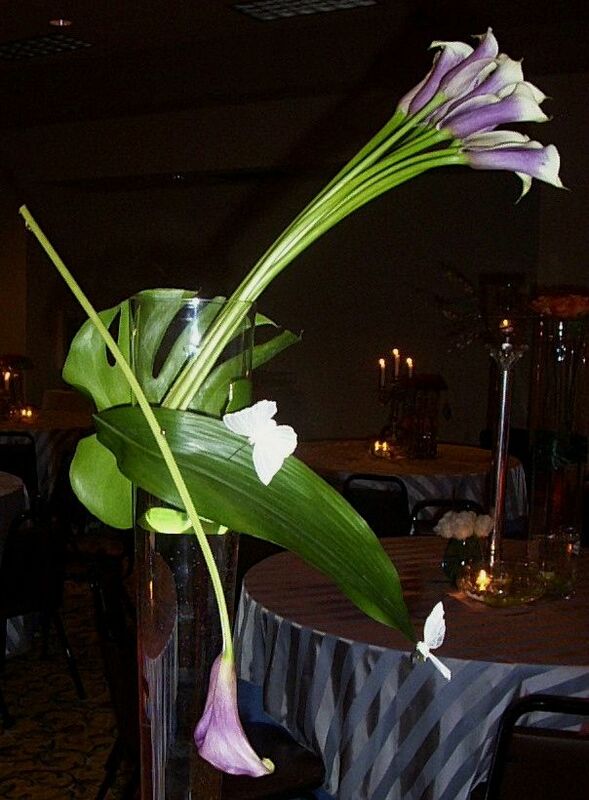 They are in an extra tall pilsner vase and used for centerpieces at a wedding reception. The third design uses three iron candle holders. It was done for a charity wine tasting dinner. Of course, when the word charity or not-for-profit is involved the budget is little-to-none. 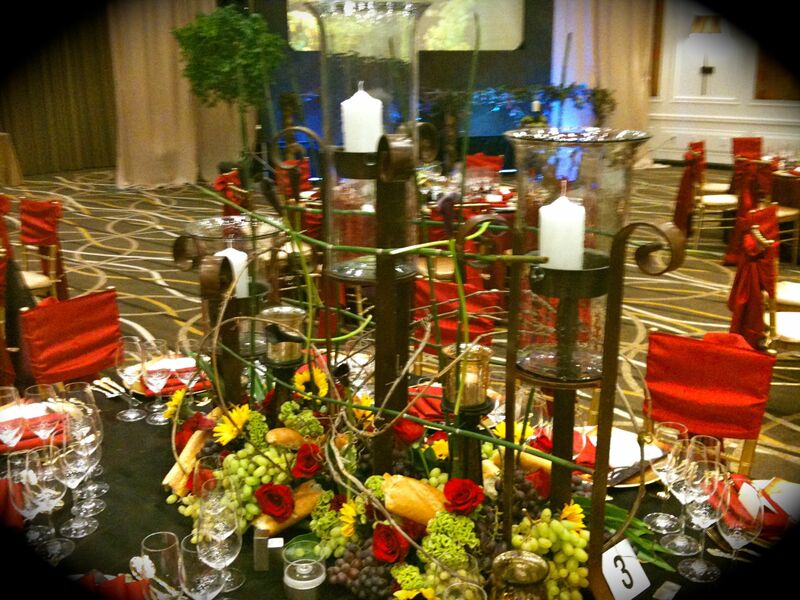 Here, to create the dramatic look grapevine, bunches of red and white grapes and loaves of bread were used to elevate the theme as well as give a base for a few red roses that accentuated the table linens and sunflowers that gave a pop of color. 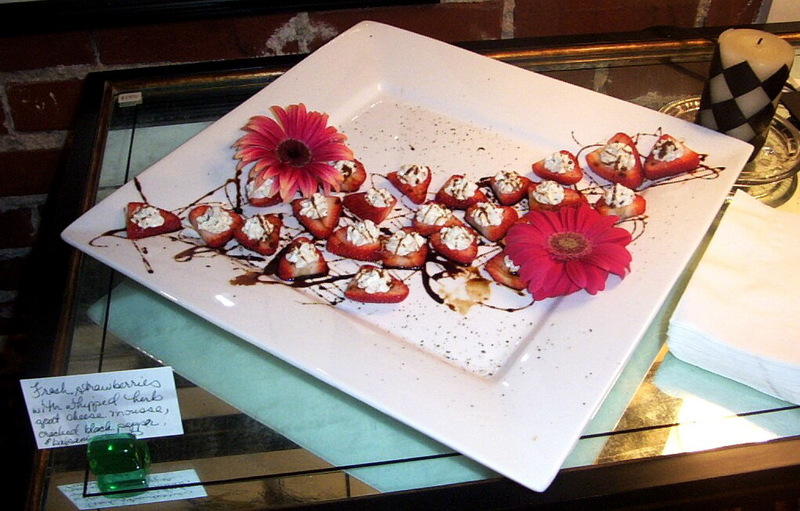 For a casual cocktail party strawberries are dressed for the season with a bit of goat cheese, a drizzle of balsamic glaze and cracked black pepper. Gerbera daisies are added to the platter in lieu of doing flowers on the serving table. 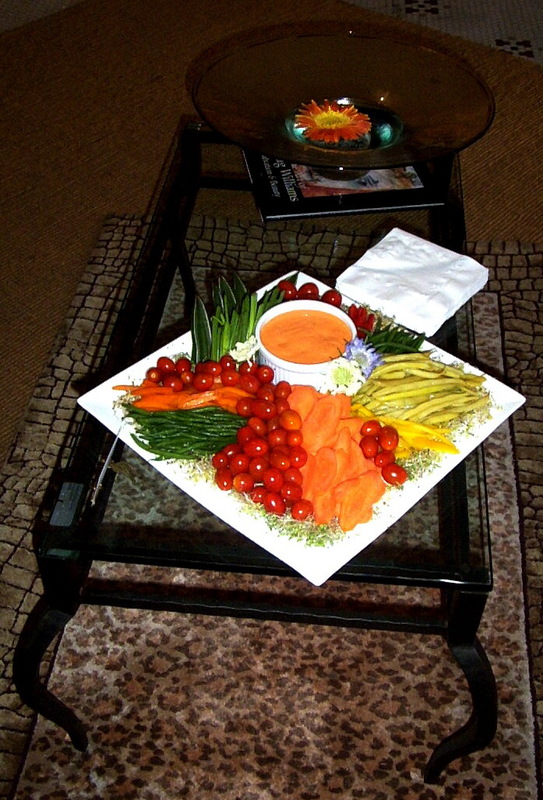 While the “vegetable tray” seems like an after thought it seems that crudite of some sort is always a welcomed nibble. Here we didn’t include the basic cauliflower and broccoli and did a combination of fresh, blanched and pickled items with a roasted red pepper dipping sauce. Oh, how I look forward to summer melon. Here, prosciutto wrapped melon is presented with lime zest, basil oil and gray sea salt. The succulent bites are presented on foliage from the garden and accented with gerberas. 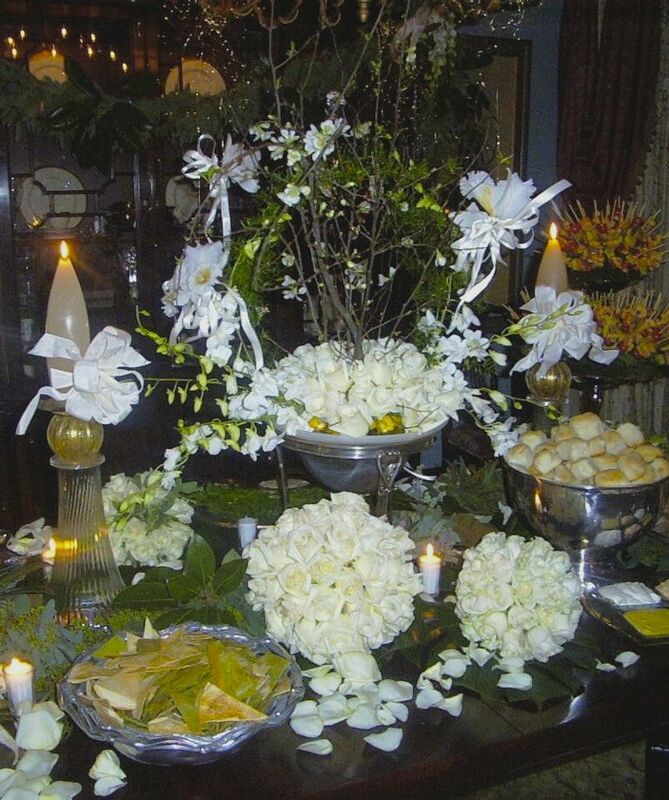 This is a buffet table for a wedding reception held in the couple’s home after a private wedding ceremony. Roses and orchids were used in containers the couple already had. The event was held in May so blooming branches were available for texture and drama. This wedding was all outdoor…ceremony, cocktails, dinner, dancing and late night after party. All in one location and all FABULOUS. 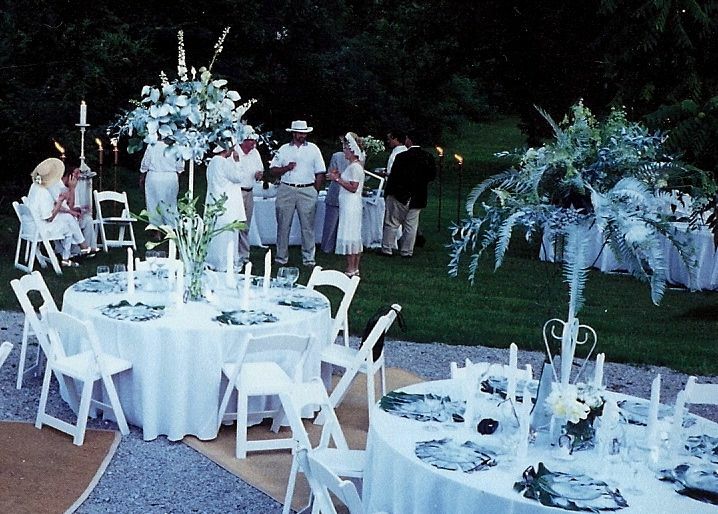 This is the place card and welcome table featuring “wads” of hydrangea in French flower buckets and three elegant chandeliers that offered a warm glow to the lawn that night. As the guest departed monogrammed thermos’ of coffee were offered the guests to enjoy on their bus ride back to the hotel. 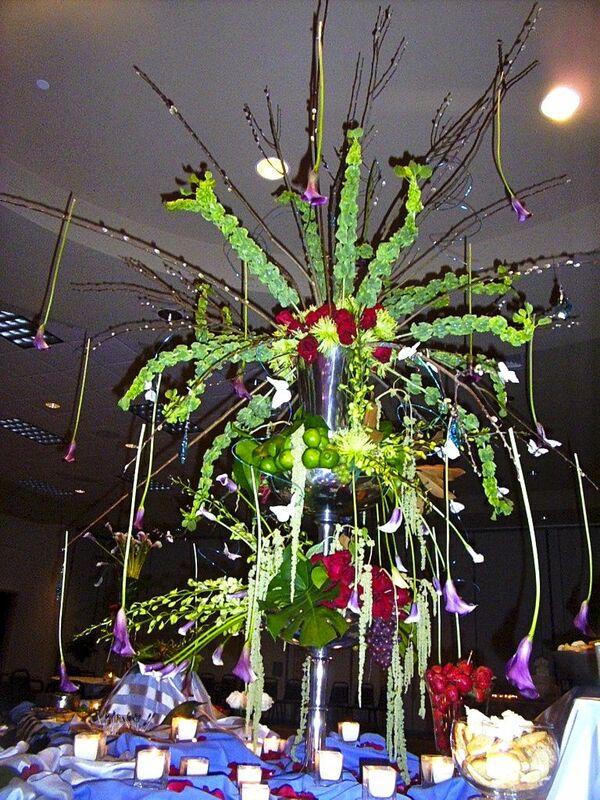 This is a buffet centerpiece in a large ballroom. The decor needed to be large to fit the scale of the room. Limes and grapes give texture to the three-tiered design. This is my nieces evening wedding. 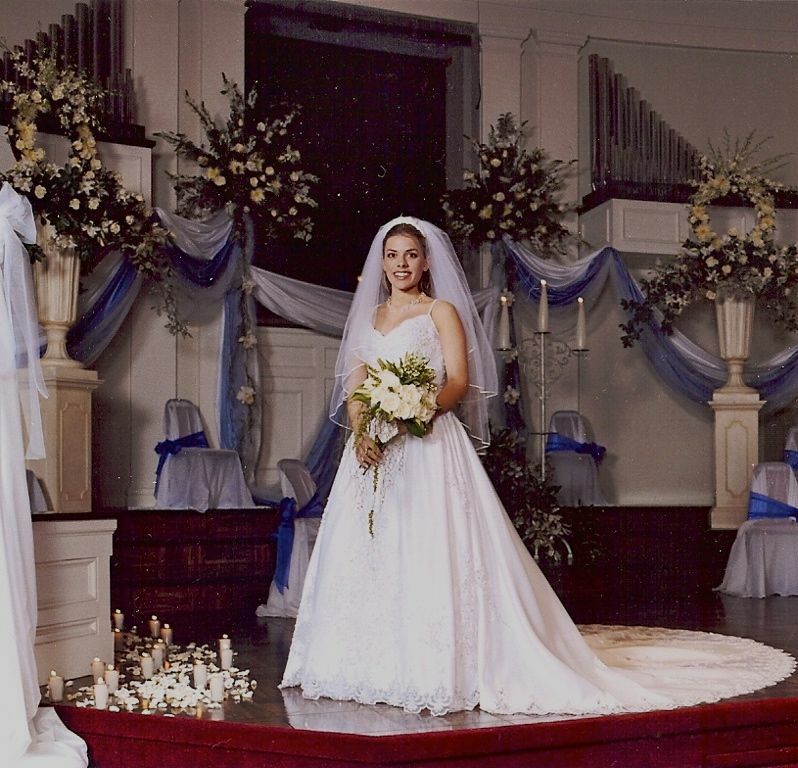 The bridesmaids wore the same blue seen in the swags and chair scarves. They were seated in the chairs with the groomsmen standing behind them to “witness” the ceremony. 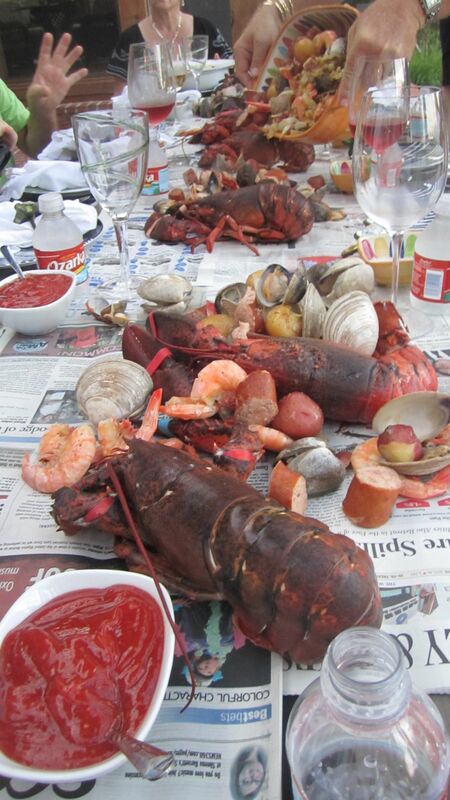 The farm table on the upper deck was set for a lobster pot and cheerfully decorated with outdoor motifs. 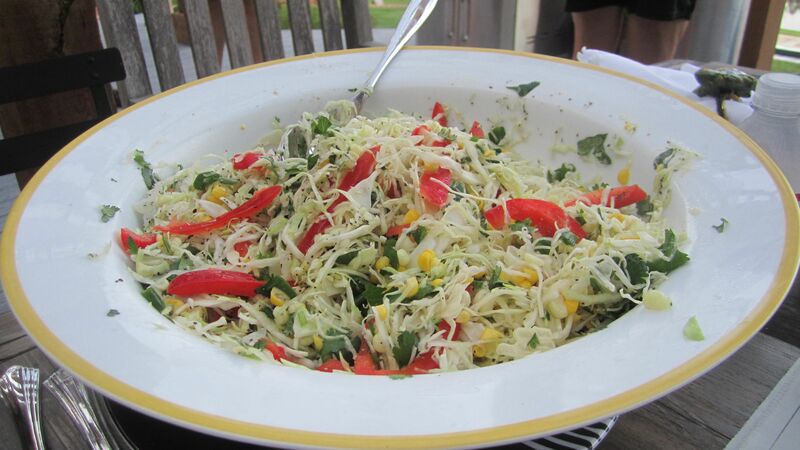 Dinner included a fresh slaw with lots to texture and an equally fresh dressing of lime, cilantro and olive oil. 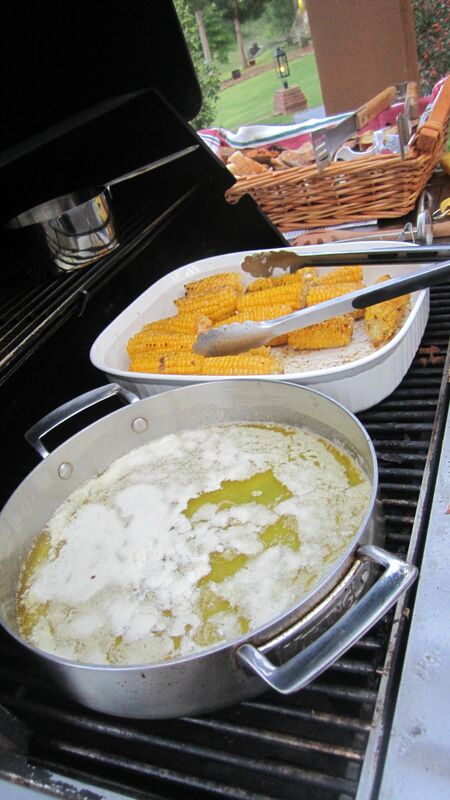 Melted butter and grilled corn were added to the table laden with Ina Garten’s Kitchen Clam Bake…that we did outdoors. Hopefully, some of these ideas will help you make your Spring and Summer events lovely and I know a good time will be had by all. Previous Post Rise Up and Eat!!! Next Post It Can’t Get Any Fresher!! !